Air Wick Scented Oils Plug In Air Freshener Warmer adds a consistent long-lasting fragrance to your home.Plug in the scented oil warmer and enjoy the advanced design that allows you to adjust the fragrance to the level you desire.The Plug In Air Freshener Warmer's sophisticated look complements your home decor.It comes with a rotating plug for horizontal and vertical outlets and leaves the second outlet free.It is easy to replace any empty oil cartridges with new Air Wick Scented Oil plug in air freshener refills. This is the combo pack of 12 Products. 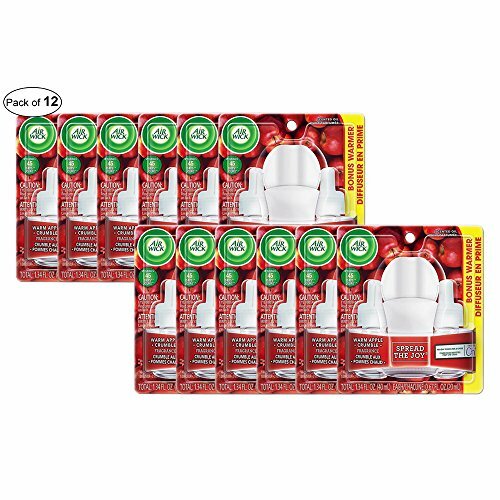 Air Wick Scented Oils Plug In Air Freshener Warmer adds a consistent long-lasting fragrance to your home. It is easy to replace any empty oil cartridges with new Air Wick Scented Oil plug in air freshener refills. The Plug In Air Freshener Warmer's sophisticated look complements your home dcor. It comes with a rotating plug for horizontal and vertical outlets and leaves the second outlet free. If you have any questions about this product by Air wick ®, contact us by completing and submitting the form below. If you are looking for a specif part number, please include it with your message.